Botulinum toxin is a medication that injected in small doses into certain facial muscles, improves expression lines and changes muscular dynamics, which gives you a more relaxed and rested appearance. It is a neuromodulator, not a facial filler. It is a safe medication whose first indication in medicine was in the treatment of involuntary muscle spasms like blepharospasms. Its cosmetic benefits were discovered later, and it is currently the most-used substance in non-surgical facial rejuvenation. During your first consultation, Dr. Nieto will evaluate your treatment options in accordance with your individual characteristics and preferences. There are basically three areas where botulinum toxin works especially well: the forehead, the glabella (space between the eyebrows), and the crow’s feet. The goal of this treatment is not to have a stiff or paralyzed face, but rather a more relaxed one. Botulinum toxin treatment is performed in the office following the application of an anesthetic cream that makes the treatment more pleasant. 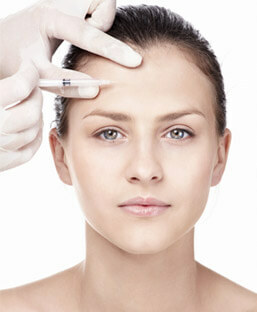 The treatment is applied within 5-10 minutes and the effect appears 3-5 days later. The treatment’s effects last for 4-6 months, and then the treatment must be repeated in order to maintain the effects, although it is common for smaller doses to be required in the retreatments. Complications from botulinum toxin treatments are rare and are always temporary, since the effect of the medication itself is never permanent.